If you’re like me, then you really enjoy giving a gift that you know the recipient is going to love. Many of us have people on our lists that can be challenging to shop for. For these people as well as everyone else on your list, we have five unique gifts we’d like to suggest that all start with something everyone can use—a coffee mug. The classic coffee lovers gift! For all you need to start you on your way to enjoying a nice hot cup of joe, we suggest our Get More Out of Life mug paired with a bag of Starbucks coffee and a package of yummy cookies. 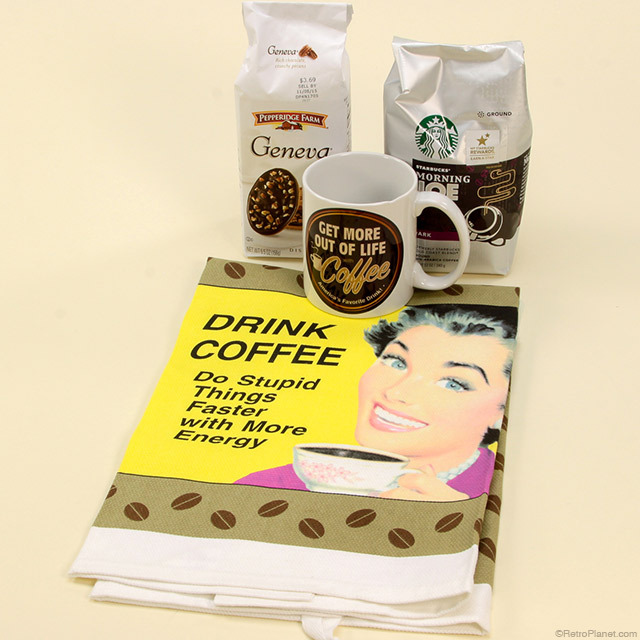 And to keep things light, add a Drink More Coffee Funny Kitchen Towel with a genuine retro look. Cupcake lovers rejoice! Our Cupcake Coffee Mug is the perfect starter for this confectionary gift. 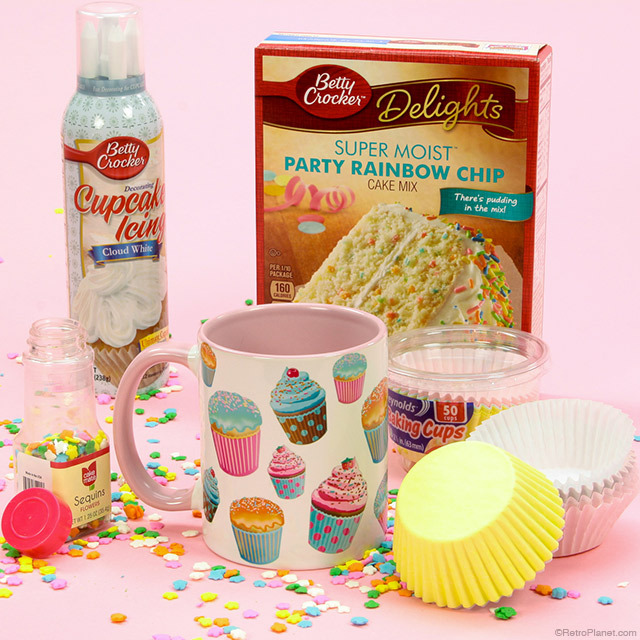 Add a store bought box of cake mix, baking cups, ready-to-use frosting and colorful sprinkles, and you’ve got a gift that any cake-fiend will love. An especially great gift for Dad or any other baseball fan, this baseball themed gift is one that will definitely be enjoyed. 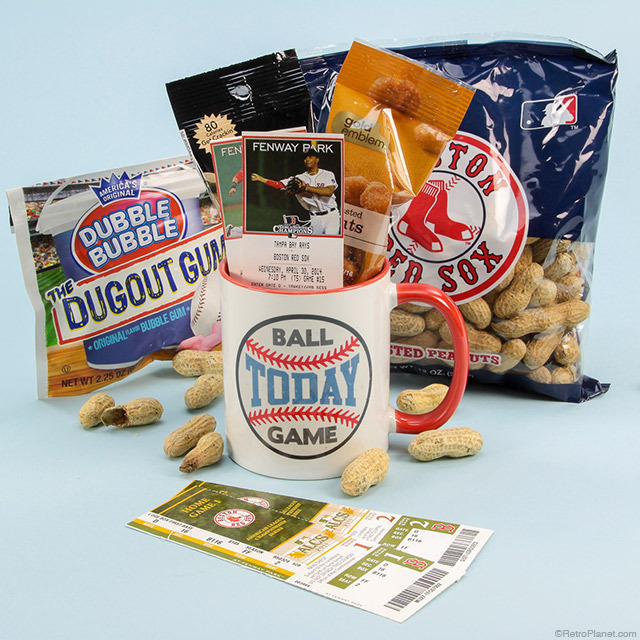 Begin with our Ball Game Today Coffee Mug, add ballgame tickets (any team will do! ), round out with a bag of roasted peanuts, pistachios and a big bag of bubblegum. Gifts for men can sometimes be challenging but grooming accessories are usually a safe bet. 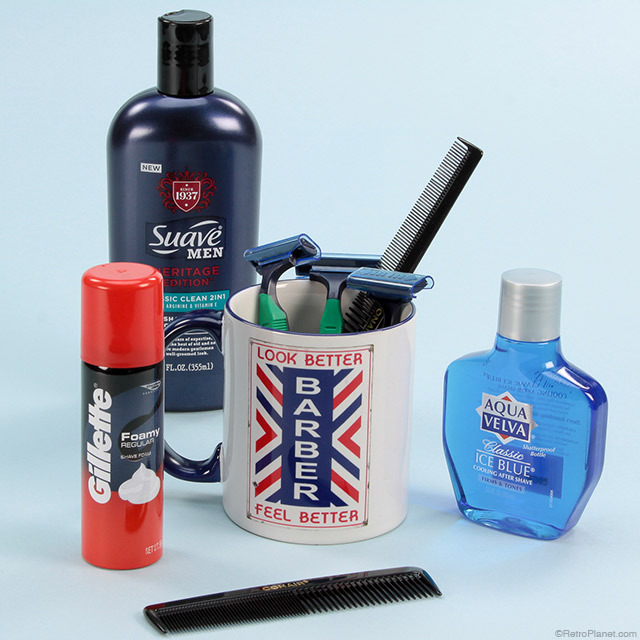 Put together a gift that’s both unique and thoughtful when you start with a Barber Look Better Mug and add useful items you can find at your local store like disposable razors, combs, shampoo, shaving cream and after shave. We haven’t forgotten the tea drinkers on your gift giving list and have put together a great mug as a gift starter suggestion with the Special Blend Tea Mug. Adding your own touches will let them know you think they’re pretty special. 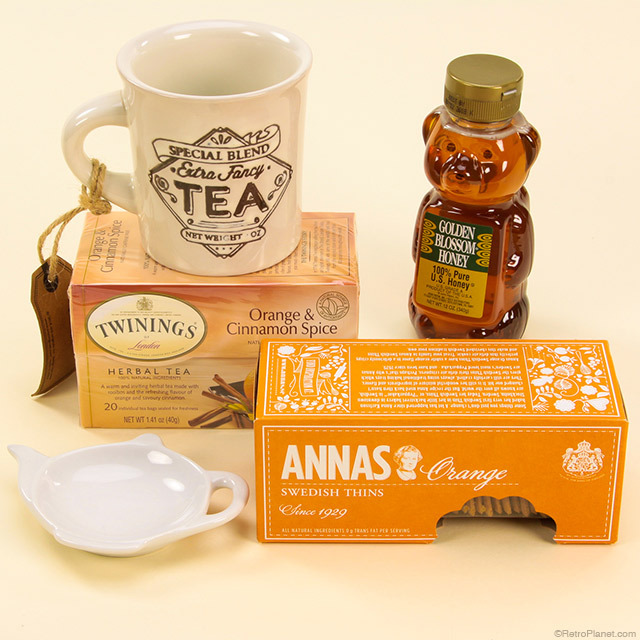 Our gift giving idea includes our Teabag Rest, some store bought aromatic spiced orange and cinnamon tea, 100% pure honey and some orange biscuit thins. As a tea drinker myself, I’m loving this idea! Retro Planet offers a wide variety of coffee mugs that are a fantastic start to creating the perfect coffee mug gift. We offer hundreds of unique coffee mugs to choose from including novelty, diner and kitchen style mugs. Many mugs feature Retro Planet original designs, giving you a unique gift you won’t find anywhere else. So, pick a theme to get started, select one of our mugs and have fun adding items personalized to the gift recipient. Most of the items we added in with the mugs can be found at your local grocery store. Retro Planet also offers thousands of items that will go great with your theme, including keychains, magnets and other unique gift items, so be sure to browse our site for more inspiration. We do not sell the sets as shown. These are gift ideas we are suggesting that you can put together using coffee mugs that we sell.